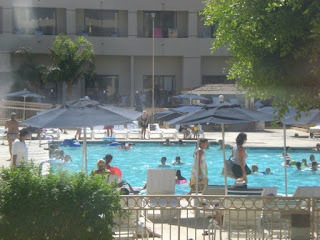 So I just got back from beautiful but hot Palm Springs, California yesterday and I have some pretty exciting news. On Saturday night Amanda, the love of my life, and I went out on a special date, just the two of us. 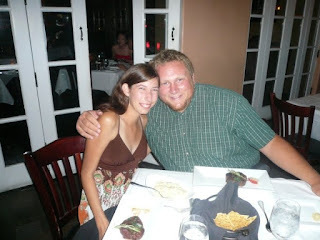 We went to a fancy restaurant called the Falls Prime Steakhouse overlooking the Palm Springs main drag. 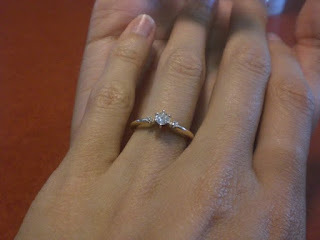 At dinner I asked her to marry me and she didn't even hesitate (I guess even after more than two years of dating she still loves me). We celebrated over some really awesome Fillet Mignon and the whole weekend became a celebration of our engagement with some of our best friends. I can't say I was nervous. I guess it's just that for me marrying Amanda is not a difficult decision. We just belong together I guess. There's not a doubt in my mind that she's the one I want to share the rest of my life with, and so in a way I'd made this decision a long time ago. So asking her to marry me was just natural. I guess I should have been worried about her saying no, but I just wasn't. And so here begins a new journey for me and for Amanda... another step on this path... another step in the right direction. I am excited to say that I now can look forward, in a very real way, to spending the rest of my life with my closest and best friend, the most beautiful woman on earth, and the most caring and compassionate individual I know. Well done Wes and Amanda! You guys look awesome! I am excited for the new chapter in your journey together. Maggie and I have just entered our third month of marriage and I send you my prayers and love. Sick Buddy! Congratulations!!! Tara and I are so stoked for you!!! Congrats Wes! What an awesome in your journey together! Congratulations, Wes - I'm excited for you two. My wife and I celebrated 12 years of marriage this summer, and they have been great. I couldn't write a better script. I pray that as you two begin the next stage of your journey together, that God will be your goal - both of your goal - so that as you reach toward that goal, you will grow closer to one another as well. Oh my gosh, this is definitely exciting news!! I am so very happy for you! Congratulations!! You just made my day right now. I had the silliest grin on my face when I read this post. I will have to say, you two are definitely made for one another and good luck on the next chapter of your lives together =) I love you guys!